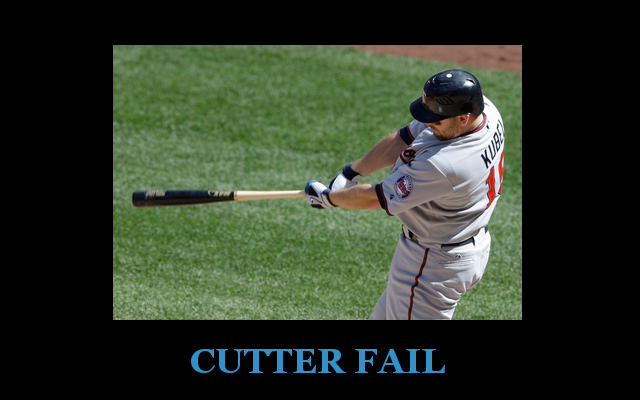 Kubel and the Cutter FAIL: An Unlikely Yet Significant Outcome | That's Twins Baseball. A Minnesota Twins Blog. Kubel isn't emo-like, he hates cutters. The Twins beat the Yankees on Sunday to avoid another sweep in New York. The path to victory was less than predictable, unless you’re name is Biff or Marty McFly. The Twins had the bases loaded in the top of the 8th with 2 outs against the best closer in baseball Mariano Rivera. If you didn’t have a bad feeling in your stomach, you hadn’t been watching many Twins games this season. So while waiting for the inevitable broken bat ground out by Kubel, an inexplicable event took place, Kubel crushed a Rivera cutter over the right field fence for a grand slam. I’m sure my neighbors thought I was having a domestic dispute with a girlfriend named Mo because I began shouting F U MO while Kubel rounded the bases. This was exactly what the Twins needed and it’s significance may extend well beyond this game. The Twins failures with the bases loaded this season have been well documented and perhaps this grand slam ends our bases loaded slump. Jason Kubel lead the Twins with 103 RBI last season but so far has been offensively challenged, perhaps his grand slam busts him out of his hitting slump. While this may just be one game in a long season, it’s significance will rank among the top come seasons end. The Twins had lost 12 straight games against New York and it was becoming increasingly frustrating with each loss. Perhaps this victory changes our attitude and perhaps we ride this feeling the rest of the regular season leading to a deep playoff run…..perhaps. Thoughts on Upcoming Twins Yankees Series. Are you sure they thought you had a “girl”friend?